I love to shop. At one point my love for new and cute had me thousands of dollars in debt. I was in college and for some reason thought credit cards were more like free money and lived accordingly. I bought new clothes even while I still had clothes with tags hanging in my closet. For any new event I was invited to, I bought a new outfit. I cared a little too much about having something new or others thinking I looked “cute”, than I did on the credit card debt I was racking up and the cost of out-of-control spending. Then I met Jesus and my view on money and materialism changed drastically. Since then, while I still love to shop and buy new clothes, I have shifted my perspective (and my spending habits) quite a bit. I realized you can love having new clothes or enjoy fashion without having to spend tons of money or have a closet full of stuff. For the most part, fashion changes too quickly anyway and trying to keep up with trends just keeps us spending on things we won’t wear in a year or two. And if money is meant to be stewarded, not merely spent, maybe buying a new shirt every week wasn’t the most honoring thing I could do with my paycheck? I read a statistic that says, “We wear 20% of our clothes 80% of the time”. So, I started to pay attention to what I put on. I noticed I cycled through the same few things while the rest sat in my closet, some rarely worn and in perfectly good condition. So I decided to let go of that other 80% of the clothes in my closet this year and eventually, my closet went from 200+ items, to 70 down to 55 (to most recently 39). I realized the other 80% of my closet was rarely worn, and so I sold or donated most of it. Count the items in your closet (everything hanging and shoes). Go back through your closet and take out everything you haven’t worn in the past year and make a pile on your bed. Go through that pile and ask if you will wear it in the next 3 months (or the next season). Don’t ask yourself if it’s cute or you like it or if it was expensive, but if WILL YOU WEAR IT. I had some super cute items that I didn’t wear because they fit weird or were too short, too low, too tight for my comfort so I got rid of them. This step is not about if you like it but, “will you wear or not”. From that pile go through and sort by keep/sell/donate. If there are items you will wear, put them back in the closet. If there are items that are so cute and in good condition, but you know you won’t wear them, sell them on EBay, Craig’s List, or Facebook. The rest, put in a bag to donate or give away to friends! For the items you sell, keep that money in a PayPal account or cash fund for future shopping. I now use this as my shopping fund for new clothes, so I only buy new things when I’ve sold old things and made some revenue. Do this again in 3 months. Nearly every season, I go back through my closet and pull out what I didn’t wear. With the exception of fancy dresses and winter coats, if you haven’t worn it in the past year, you probably won’t wear it in the next. So get rid of it. Follow the one-in/one-out rule from this point on. 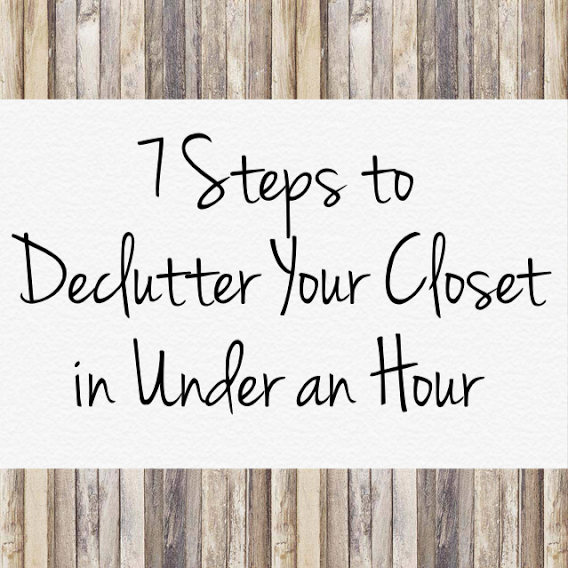 Once you minimize your closet, if you buy something new, resell or give something old away. That way you don’t just fill up your closet again in a year! Try not to buy a single item of new clothing for a whole year. I did that in 2012 and guess what? I didn’t die! If a year is too long, try for 3 or 6 months. Use only gift cards or birthday/Christmas money to shop with. I tried this the following year, but I realized since my birthday is in November followed by Christmas in December, I have an inordinate amount of sweaters compared to summer tops. So no new sweaters for me this birthday season! Sell items you don’t wear regularly. Just because it’s cute or you spent a lot of money on it, doesn’t mean you should keep it if you don’t wear it. If I’m not comfortable in something or it fits weird, even if I love it, I sell it because I know I won’t wear it as much as someone else might. Give away clothing to friends or others. If a friend compliments a top, give it to her! Find an organization to donate clothing to. My favorite is Rescue the Children, an organization for women and children coming out of homelessness, incarceration or addiction. Clothes swap! Invite friends over for a clothes swap. Bring clothes you all don’t wear anymore and shop through one another’s things FOR FREE. Sometimes I think I “need” something new, but really I just want something different to wear. I love living with less, spending less, and buying clothes that are better quality and things I really love. What about you? What tips have you tried for decluttering? Or which ones will you try? How many items are in your closet right now? How many after you decluttered? Leave a comment below and let me know how it goes! Melissa, this is such a helpful post…and timely! I had it on my “to-do” list to go through my closet and drawers today. Thanks! Oh good! So one other thing I’m passionate about besides the Gospel?? Decluttering! I don’t write about it much, but I might start after the New Year. Have fun, tell me how it goes!